A magnificent overnight, bus trip, excursion organized by Gwen on s/v "KW"(Netsel Marina) for the Marmaris Bay cruising community. The trip cost 180 Turkish Lira per person and included the bus transportation with a driver and a tour guide, admission to Ephesus, admission to the museum, overnight accommodation in a 5 star oceanfront hotel in Kusadasi and breakfast at the hotel. There were about 10 of us on the tour that were picked up at Yacht Marine at 0635 am and at Netsel at 0700, returning the following evening at about 2100. 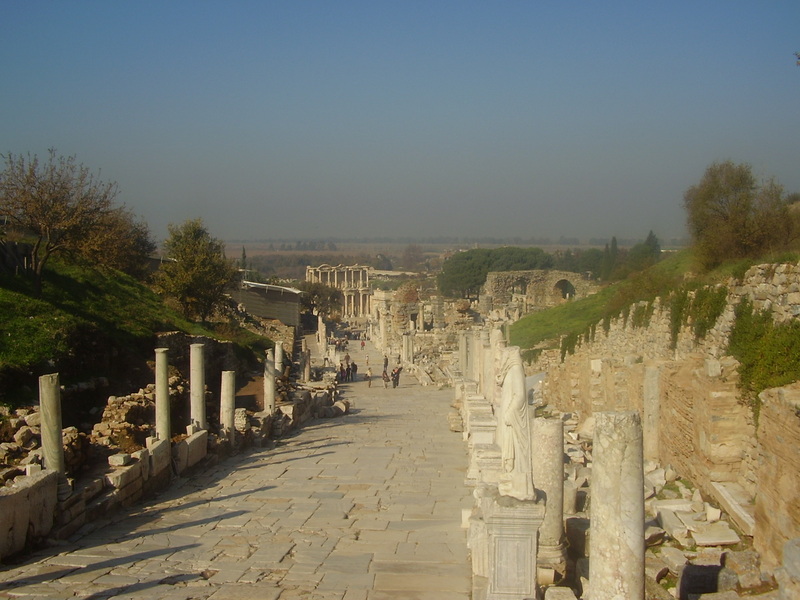 Apart from the visit to Ephesus, the tour included a trip to the Ephesus Museum in Selcuk, the remains of Artemis temple, a mosque, wine tasting and lunch in picturesque rural village of Sirence, and a visit to a carpet factory. A lovely rural village where we shopped in the alleyways and tasted a variety of fruit wines. I found the quince wine the least sweet and most palatable. One of the Seven Wonders of the World dating back to the seventh century BC, built in honor of the Greek goddess of hunting, wild nature, and fertility,Artemis. It was first destroyed by fire in 356 BC and rebuilt 33 years later. It was destroyed again almost 600 years later in AD 262 by the Goths. It was rebuilt again to be torn down in AD 401 when Christianity took over as the religion of choice. 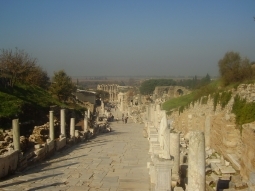 Ephesus was deserted and virtually sank into the swamp until modern excavations began in the late nineteenth century. Only a few columns have been re-erected. The temple consisted of 127 columns each 20 m in height. An interesting visit to a carpet factory where we saw how the silk is extracted from the cocoons, spun, dyed, and knotted into beautiful rugs. Of course this included the inevitable cups of Turkish tea and a bit of sales information, should we have been interested in making a purchase.